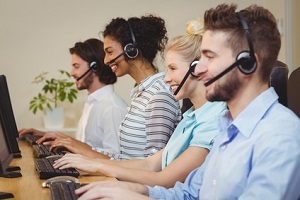 I’ve been working in the customer service front line for more than 7 years and to be honest, in the beginning I was not sure if it was the right job for me. As a young person, which way can you find it out? When you have little experience, your chances of figuring out what you are really fit for are very small. That’s because you often tend to confuse the mental and emotional states you simply have by yourself and the thoughts and emotions which your job triggers in you. For example, you may be unhappy about something in your life and then you get to deal with a difficult customer at work. Of course, the conversation goes very tough and you become even more unhappy and start feeling this is not the right job for you. You just can’t handle it! Does it mean, however, you are not fit for the job? Surely, no. With more experience, perhaps having the possibility to try different tasks or jobs, observing other people in their workplaces, you gradually start to understand what makes a certain job a fit or not a fit just for you. I must admit that customer service was not a conscious choice for me 7 years ago, it was rather a coincidence. But to my great joy, after all these years my mind has come to terms with reality and now I have a clear understanding that I couldn’t find a job, which would suit my personality and my nature better. I can clearly see what makes it easy and interesting at the same time and I am happy to share my observations with you. This post today is aimed at junior customer service professionals, who are just starting their careers in customer service and, perhaps, have doubts or concerns whether they made the right choice. You like answering questions. It’s not the same as liking to just talk or write essays. You need to really feel comfortable talking about things which interest or trouble the customer and not you. This takes a great degree of compassion and the ability to put yourself in the customers’ shoes. You don’t feel there is a divider line between your job and the rest of your life. If, say, you had a work-from-home customer service job and didn’t need to go to an office, you could easily answer the client’s question early in the morning or at night if you were free at the time and saw an incoming request. You wouldn’t start feeling “oh my god, will I ever have a break from those callers? !” kind of thing. Because honestly, there is never ever a break from callers in customer service! You are comfortable with erratic work schedule. Consumer expectations for 24/7 support availability are only growing with time. It’s no surprise that a lot of companies today are already offering round the clock customer service. So as a customer service rep you should be prepared to have a flexible, rotating schedule where you need to work sometimes day and sometimes evening or night shifts. You are accustomed to be jerked. This may sound very funny, but it is true! Customer service job is about being jerked all the time! The nature of the customer service activity is irregular. You may enjoy a few moments of downtime finding yourself making a cup of tea when you get another call or chat and off you go, back to your computer, tea cup abandoned. You should be ok with that. If you get irritated and find it difficult to switch between different tasks and activities in a short amount of time, working a customer service job will most likely be a struggle. Some people will naturally enjoy it more when they sit down properly and take their time to do their work from beginning to end, without being interrupted. Be aware that a customer service front line job will not offer you this kind of luxury. You are emotionally mature and ready to multi-task. Due to the erratic nature of the customer service activity, it is literally impossible to predict the exact amount of customer service requests and have just the right amount of people answering them at any time. There will be many situations when you will have to respond to multiple customers at the same time. Yes, it’s not easy to do that. But you will have to do your best and most importantly, even if your responses are slower than if you had to reply only to one customer, you need to keep your temper cool and make every customer happy. Yes, it is possible to do it! The major obstacle to it is losing your temper and feeling overwhelmed when having to deal with several customers at the same time. I find that the 5 statements above are the basic statements that describe a customer service “personality” type and the nature of the activity you are going to perform as a customer service rep. Of course, there are many more skills you need to have or develop in order to be successful in customer service. However, in my experience, these basic statements are what describes the uniqueness of this type of job and what makes it different from other jobs where you may also need to deal with humans, such as sales or marketing for example. So, have a second read over these statements and review how they apply to you. I hope you will find this sharing useful and it will give you a few good ideas to ponder over. Please share your feedback, thoughts and insights in the comments. This entry was posted in Articles and tagged 5 questions to ask yourself to understand if you are fit for customer service, are you fit for customer service, customer service career, customer service job, how to know if customer service is the right job for you. Bookmark the permalink. I agree with Maria that experience counts a lot in this job. I am also working in the customer service. In the initial stage, I was also uncomfortable with this job and thought that satisfying a customer is toughest. But, slowly I started enjoying talking to different customers, and satisfying their queries and enquiries. Now it is few years that I am in this job and these years taught me that to be a good customer service professional you need to have few qualities like patience, self-control, flexible, caring, communication skills, helpful, compassionate, and most of all, knowledge about the product or services you are dealing with. Thank you for sharing your experience, Franks! I think a lot of customer service professionals will agree with you on this. At first one may find the job overwhelming and difficult to handle, but if it’s really your thing, with time you find more and more satisfaction with it, when you see its value and feel people’s gratitude for helping them. I totally agree with Franks, the main and most important thing for a good customer service is to know the product or service, if we do not know little we will be able to help customers. Thank you for sharing your experience! I agree with both of you, guys, that without solid knowledge of the product or service you are supporting, you won’t go very far as a customer service rep. Thank you for sharing your experience, a very good post. Regards. Thank you for your feedback, Armarios. I do not understand another way to act, to give a good service to the customer you have to know the product very well. Agree with you, knowing the product well comes first in offering good customer service. Thank you for your comment.